I used to be pro vaccine. I know the feeling of thinking others were just plain crazy and wrong for not vaccinating their children and themselves. ‘Irresponsible!’ I said when pointing my finger. I’d use the same old arguments about polio and small pox and how vaccines saved us from all those horrible diseases and just swallowing and regurgitating the propaganda I was brought up with. It was only recently, in 2009 that I started questioning my long held beliefs and began digging in to the history, efficacy and safety of vaccines. I was appalled at what I found and the recklessness of those government health agencies entrusted with our health and our children’s safety, and angry with myself that I had put my family’s health at risk by blind faith in others when I was ultimately responsible for the medical decisions of my family. 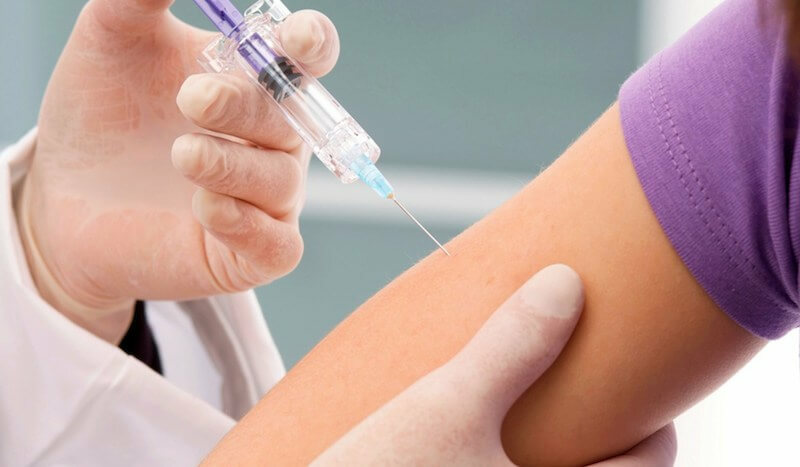 When I began to put this article together I specifically chose not to include research from or links to websites that are considered untrustworthy by most pro-vaxxers, sites such as Natural News, Mercola, etc. even though I personally trust those sites and much more than I would WebMd and for good reason [a]. Instead I chose to employ basic logic and also incorporate independent and .gov scientific studies-mostly peer review, journals, news from mainstream sources (that pro-vaxxers love and totally trust) and articles that link to other .gov scientific studies, as well as government statistical resources. So, I started writing down questions and then looking for answers. I’ll admit, some of these questions have already been asked by others, but I just expanded upon it to form a helpful list. I hope the following information helps you in your lifelong journey in search of health, vitality and truth in your own lives and your children’s lives. 1. Why are newborn babies vaccinated on their first day of life against a disease that is primarily transmitted sexually and by needles in drug users? (Pregnant women are already tested for STD’s prior to birth so there’s no reason to give it to an infant). Interesting to note, of the few vaccines that still are given to infants and STILL has thimerasol in it is Hep B and DipTet (and Flu shot recommended to pregnant women). So, the claim that it has been removed from all vaccines is a lie and misdirection. If they give it to all newborns then ALL the newborns are getting that thimerasol (mercury derivative). “It was removed from many child vaccines in 2002 but remains in some vaccines (e.g., hepatitis B virus and)” Page 21. 2. Why are babies given vaccines to produce antibodies when they do not produce antibodies until after the age of 3 to 6 months? 3. Why does the government tell parents to delay breast feeding and get more vaccines when breast feeding babies produce higher levels of antibodies? 4. Why aren’t vaccine manufacturers held responsible when their product injures your child? Why would these companies need to be protected from the effects of such wonderful products? 5. Why have no double blind, placebo, randomized controlled trials been done on any vaccines? This is standard with any other drug. 7. Why are disease outbreaks occurring in populations with 90%+ vaccination rates? 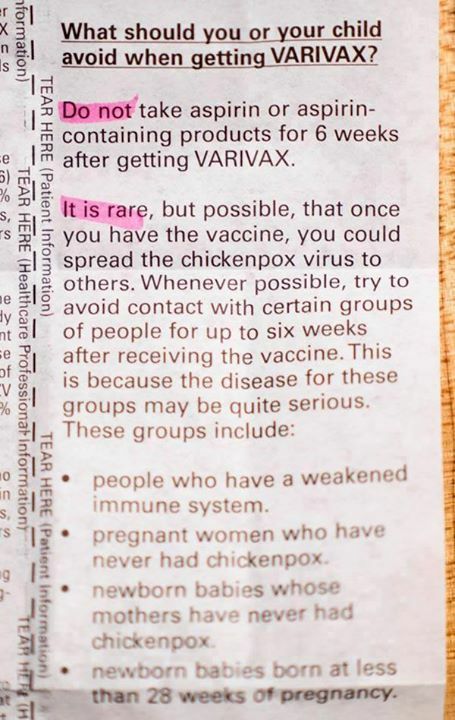 What about that ‘Herd Immunity’ guys? 8. Why are children vaccinated against these diseases still catching and spreading them? 9. Why are we frightened of non-fatal illnesses that train a child’s immune system how to behave? 10. Why are vaccine manufacturers allowed to reduce antigens and insert cheap and toxic additives that aggravate the injection site? 11. Why do we need multi-dose vaccines if the number ONE priority of vaccine manufacturers is your child’s safety? 12. Why will no physician sign a written guarantee for a child’s safety prior to vaccinating them with products they insist you take and that they say are completely safe? 13. Why is there no outrage about the 3.1 billion dollars paid out in vaccine injury/death claims and yet they claim there is no correlation and they are perfectly safe? 14. Why don’t people recognize from history that the most widespread and lethal diseases in the last 200 years were reduced due to cleaner drinking water, improved sanitation, nutrition, less overcrowded areas and better living conditions? 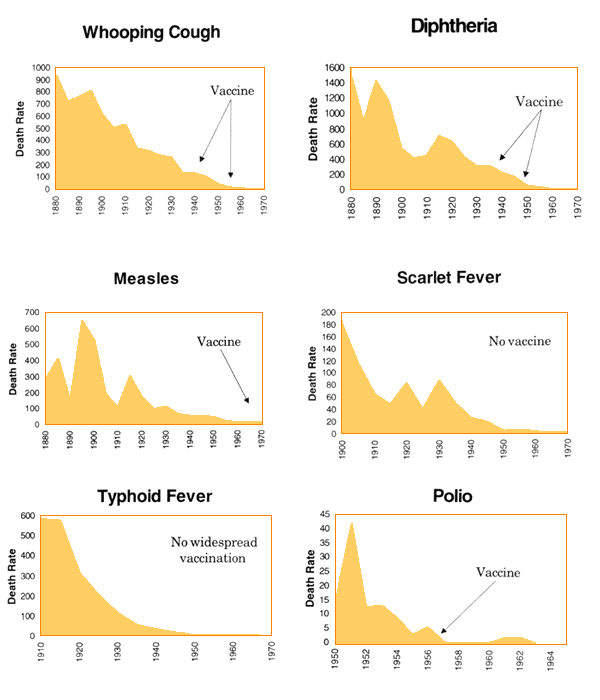 Vaccines were introduced at points in time where every single disease was already declining, most almost completely gone. To give vaccines credit for global reductions in disease is like giving a band-aid credit for healing a wound that was already closing. Dr. Hans Rosling shows exactly how the health condition of nearly all countries of the world have improved with wealth, even 200 years ago, at the times where there no vaccines. By the late 1950s, even before the introduction of measles vaccine, measles-related deaths and case fatality rates in the United States had decreased markedly, presumably as a result of improvement in health care and nutrition (Oxford Journal of Infectious Diseases). 16. Why are almost all pro-vaxxer adults we talk to not up to date on their adult vaccinations/boosters? 17. Why do pro-vaxxers ignore .gov scientific studies? 18. Why didn’t our government health agencies ever safety test thimerasol (a mercury derivative and adjuvant) since Lilly developed it in the 1920’s? 19. Why is it that only 40% of health professionals receive the flu shot each year? They must not believe in it. 21. Why doesn’t the pro vaccination public admit that the vaccinated spread disease and stop blaming us? 22. Why do people still trust their government health agencies when they say vaccines are perfectly safe? With all the big pharma fraud cases, Merck, Glaxo Smith Kline, etc. and all the class action suits that come out several times a year for death/injury you see on tv commercials every week, combine that with the VICP and VAERS .gov statistics, and Iatrogenic Death statistics, why do people still trust their government health agencies when they say vaccines are perfectly safe? Having said that, why is government trusted at all since Democide statistics (death by government) show that nearly 300 million in this last century were killed by the state. Those are non-combatants. 23. 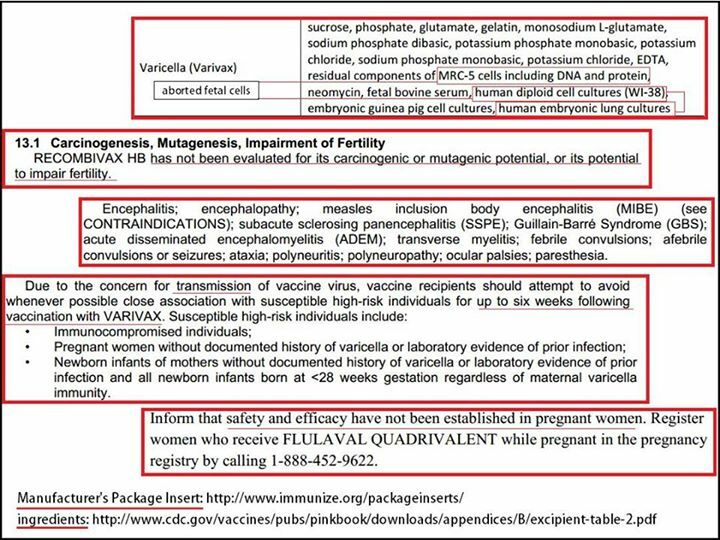 Why do they put aborted fetal cells in Vaccines? Also DNA from monkeys, chickens, human tumour cells? 24. Why is Aluminum being used as an adjuvant in vaccines when there are many .gov studies against it’s use as Toxic? 25. Why do people think the government can’t get away with secret human testing of disease, drugs, and chemicals on us when they have done it and apologized for it numerous times? When they put toxic ingredients in vaccines, food, drugs, water and our sky that have no long term safety studies by any government health agency, that is tantamount to human experimentation. It’s a crime under the Geneva Convention, Nuremberg Code and our own constitution, and against medical informed consent laws. Thank you. I’ll check the link and correct. I appreciate the feedback.